OK.........I've been hinting around about a few projects in the works and I finally buckled down last night and stayed up late to finish one of them so I could post it. Since I've started the new running program I haven't been staying up very late but today was a rest day so I made an exception last night. My inspiration for this project was some burlap monogram lampshades I saw over on Rhoda's blog a while back. 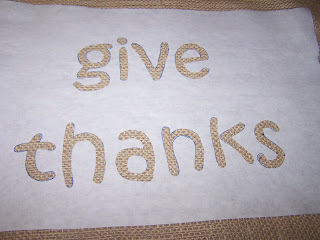 I thought it was a great idea and I love doing freezer paper stencilling. 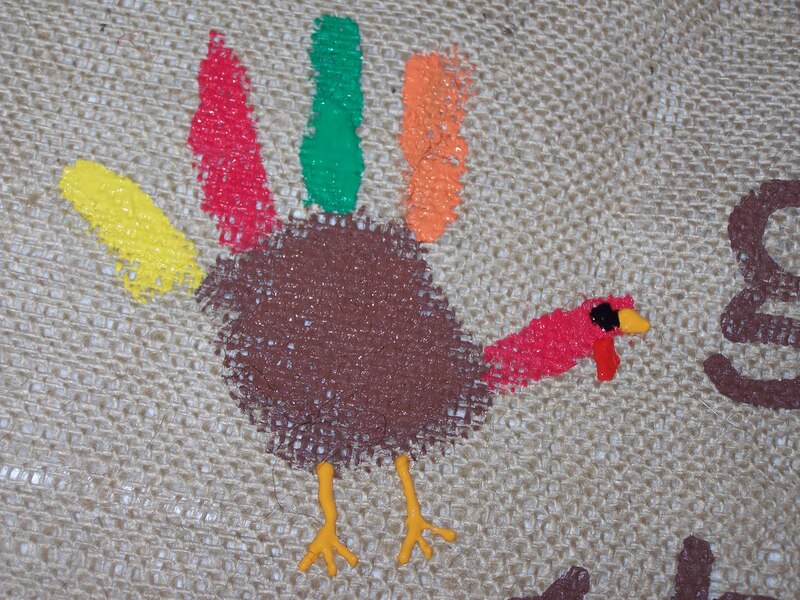 Immediately I could envision how cute it would be to do a "give thanks" pillow on burlap with my boys' handprints decorated like turkeys and that is what I decided to try to do. In case you are unfamiliar with freezer paper stencilling I decided to make this a detailed step-by-step post. If you aren't interested or already know how scroll down to see the finished pillow. 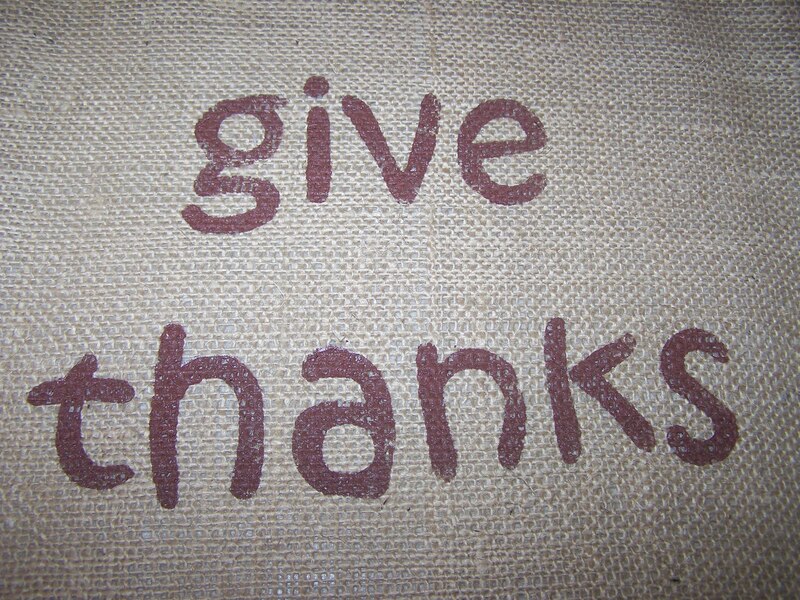 First I found a font I liked and printed out the words "give thanks" in a Word document using landscape orientation. The font I used is called Kristen ITC. I just kept enlarging the font until it pretty much filled up the entire 8 1/2 by 11 inch space. My font size was probably about 200 although I can't remember exactly. I also used bold typeface. Once I had it how I wanted it (I also had to adjust the margins to make them as narrow as possible) I printed it out. I then placed the copy underneath a piece of freezer paper (shiny side down) and traced it onto the printer paper with a pen. See photo below. The next step was the most tedious and probably took me about 30 minutes. I did it while watching TV. 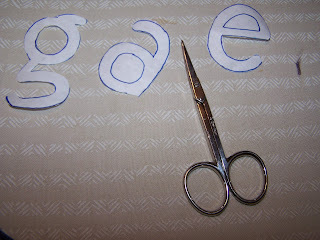 Using nail scissors I carefully cut out the insides of all the letters from the freezer paper. 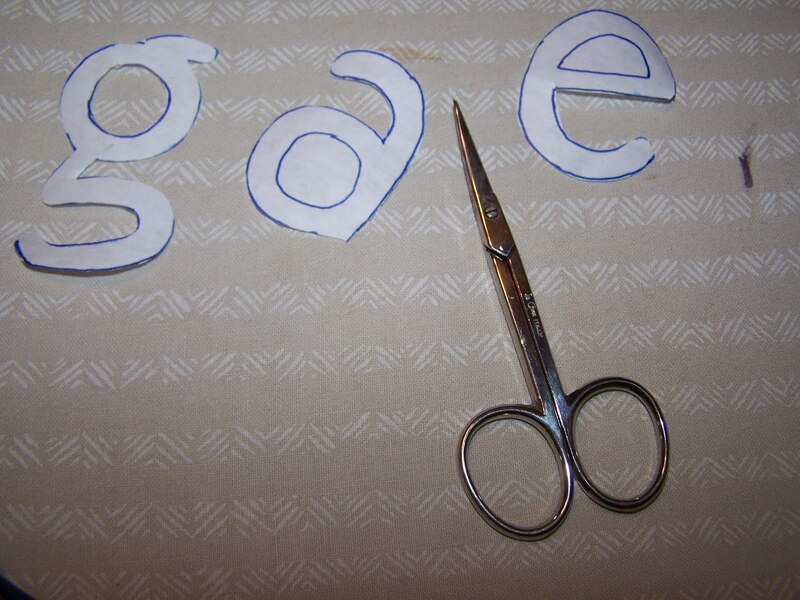 Make sure when you do this to cut out the middles of your letters and don't discard them as you will need to iron them on during the next step. 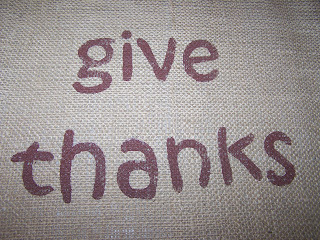 Once all the letters were cut out I ironed the freezer paper (shiny side down) onto a big piece of burlap. Use a dry iron for this or the freezer paper will get wrinkly. Be sure to carefully iron on the center of your letters with open middles. Check to be sure all edges are adhered securely to the fabric. Next, using a paintbrush (sponge ones are great for this) tap fabric paint inside all the letters until they are covered as shown below. You may need to add another coat. I usually do this one right after another instead of waiting for the paint to dry between coats. I'm impatient like that. You will need to let the paint dry for several hours (I usually do this after the boys' bedtime and let it dry overnight). Once it's dry, carefully peel off the freezer paper to reveal your image. This is my favorite part of freezer paper stencilling. It always looks so good when you peel off the paper. I was a little leery of how this would turn out on burlap as I've only ever freezer paper stencilled on knit jersey fabric. It worked like a dream!! This one is my little boy's hand. And my big boy's hand. I finished the painting about a week ago and last night I finally headed down to the craft room to sew the pillow. I just cut an even rectangle around the painted part and then used that as a template to cut a second piece of burlap for the back. I sewed the two sides together (paint side out) leaving a very wide margin all around so I could trim it afterwards. I left a hole a few inches wide and stuffed the pillow full of polyester fiberfill. Then I sewed up the hole. 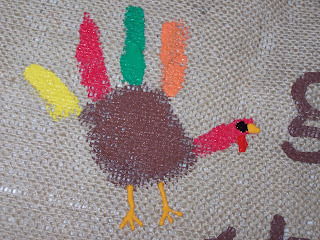 It was pretty easy to do this even though the pillow was full of stuffing. The final step was to trim all the edges evenly (eyeballed it) and then fray the edges to give it a fringed trim. 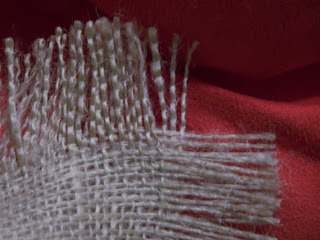 The stitching line stops the fraying so I just pulled out strands until I was really close to the stitching. I LOVE the fringed trim. 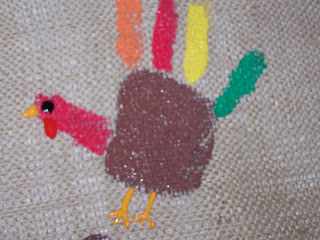 It's just about my favorite part aside from the hand turkeys. Oh.......and I also love how the saying turned out. OK............I just love the whole thing. It's fun when an idea goes from your head to reality and looks as good as or better than you imagined it. This will be a fun keepsake to pull out and display each November. 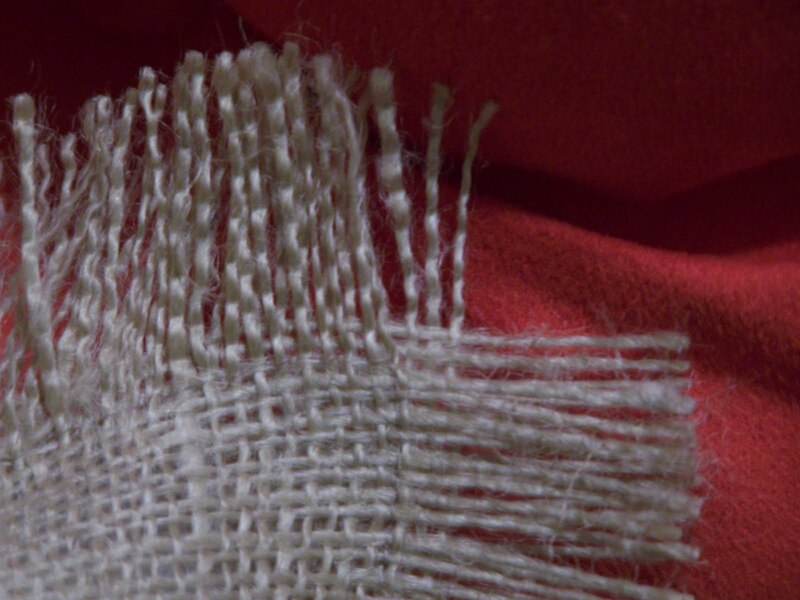 Here's a close-up of the fringed corner. If you like this idea but are intimidated by the sewing part think of how cute this would be just done up on burlap, fringed, and hung on a dowel instead of being made into a pillow. You could also frame it. Many possibilities. When I bought the tan burlap at Hobby Lobby I also bought about a yard of red burlap. (Burlap is really inexpensive by the way.) I thought it would be very cute to make some little red pillows with "ho ho ho" stencilled on them for Christmas. So........that's on the to-do list too. A burlap pillow (or burlap in a frame) with a monogram would make a great, easy and inexpensive Christmas gift. 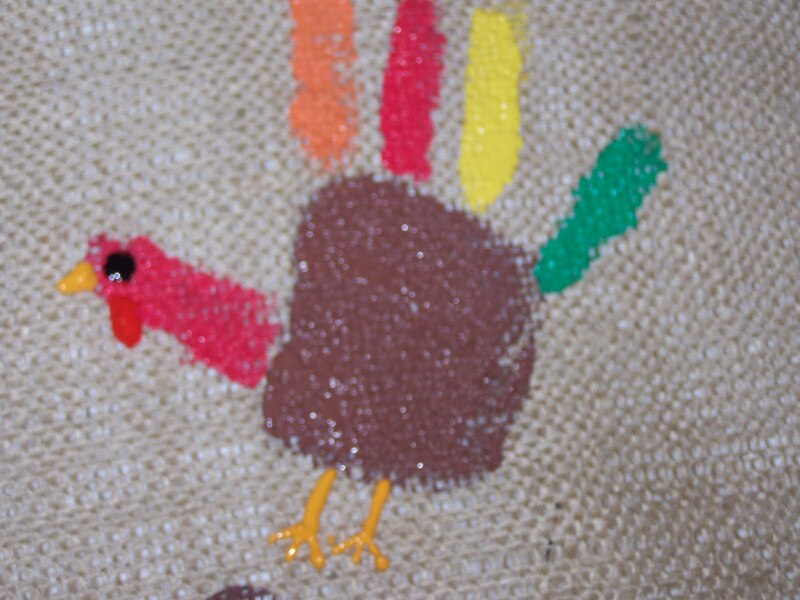 Your children could help out with the painting and stuffing part. I have a lot of burlap left and am already thinking of more project ideas. Fun, fun, fun!! Your "ho ho ho" comment makes me wonder how you handle Santa Claus in your house. Do your children believe he is real? Do you teach about St. Nick? This is my 4.5 year old's first year in school so I'm sure he'll be learning a lot about Santa there and I don't know what to do about it since we weren't raised to believe in him and I don't feel comfortable teaching it to him. If you had time to share your thoughts, I'd much appreciate it! Oh, and the pillow looks wonderful! Adorable!! 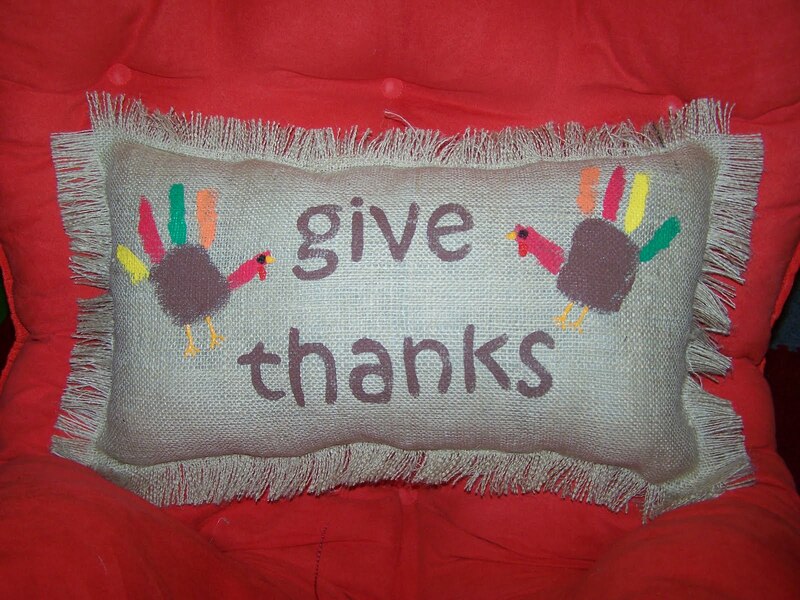 I love the burlap and turkeys, very sweet and your Ho-Ho-Ho pillows sound adorable : ) Happy Holidays. Anna - I haven't taught my children about santa, the tooth fairy etc. We have told them that other children believe in them and it isn't kind to tell them otherwise. However, although they are lovely stories they are only stories and we don't like to tell lies in our family. My older children (age 7 and 9) enjoyed finding out about the Green Man and how winter solstice stories led into the father christmas stories. We found out the legend of Saint Nicholas and lots else besides. Annicles: thanks! I was trying to think of a way to not lie to him but not have him telling all the other kids that Santa isn't real. That's a good way to put it. My parents never taught us to believe that Santa was real and I always appreciated them for that as I knew I could trust them. Same with the tooth fairy, etc.